After a long, cold winter in Michigan, nothing is more refreshing and exciting than seeing the first buds of flowers peeking from the newly thawed ground. The spring and summer months are full of intense beauty and color when all of the wildflowers are in bloom, showing off their amazing color displays. Michigan offers a wide variety of spring wildflowers, many of which are located only in specific regions. MNA sanctuaries protect many of these rare and beautiful flowers, preserving their beauty for visitors to enjoy for generations to come. Red trillium. Photo by Al Menk. The trillium has been used to symbolize purity, simplicity, elegance and beauty for years. Every spring, the woods of Michigan are filled with the beauty that the trillium has to offer. Trillium typically thrives in moist, woodland settings where rich, acidic soil is present. At first glance trillium appear to have unbranched stems, but they actually produce no true leaves or stems above ground. Instead, the stem is an extension of the horizontal rhizome (a stem that grows underground continuously and sends out shoots and roots above the ground) and produces small bracts that look like leaves. These flowers have three large petals that can be found in a variety of colors. Their seeds are distributed by ants that feed on the oil-rich structure, called elaiosome, that is found on the seeds. Four trillium species are protected in Michigan. The state lists toadshade, prairie trillium and snow trillium as threatened and painted trillium as endangered. MNA sanctuaries protect several trillium species, such as drooping trillium, red trillium, painted trillium, prairie trillium and toadshade. The biggest sources of threat are animal grazing and urban development. Deer are known to feed on the flower which leads to diminishing populations. Several MNA sanctuaries are home to this striking flower. Dwarf lake iris. Photo courtesy of MNA archives. This beautiful flower grows nowhere else in the world but in the Great Lakes Region, making it a rare sight to see and a favorite among visitors. This unique flower is also Michigan’s state wildflower. Most of the population lies within Michigan and is heavily concentrated along the northern Great Lakes shoreline, but they are also found in Wisconsin and Ontario. They grow on sand or thin soil over limestone rich gravel or bedrock. The dwarf lake iris tolerates the full sun to near complete shade, but flowers mostly in semi open habitat. These plants bloom from Mid-May to early June and are threatened in the state of Michigan. The dwarf lake iris can be distinguished by its tiny size and thin, yellow rhizomes or underground stems. The slender rhizomes produce fans of flattened leaves that can reach a height of six inches. The light green leaves are no more than half an inch wide. The flowers of the dwarf lake iris are a deep, dark blue that are produced singly on short stems. These flowers grow in dense bunches that form a brilliant blue carpet. The ram’s head orchid, or ram’s head lady’s slipper, is a species of special concern in the state of Michigan. They can be found through northern lower Michigan and across the Upper Peninsula. These plants can be characterized by three to five bluish-green elliptic leaves that sprout along the stem of the flower in a spiral arrangement. They produce a small, terminal flower that has a pouched lower lip. The petals of the flower are similar to the leaves in shape, but are wavy. The flower has purple or brown sepals, which are often streaked with green. The pouch of the lip is white and marked with purple, crimson or green net-like veins and the mouth of the pouch is hairy. These flowers only grow to be about 30 centimeters tall. The ram’s head orchid is appreciated for its delicate beauty and pleasant fragrance. It is also one of the most distinctive of the lady’s slipper orchids. The ram’s head orchid grows in confined cool, moist wetlands and coniferous forests. They also have a preference for moist, mossy bogs. They are very long-lived and can take 10 to 16 years to reach maturity. Flowering occurs from mid-May to mid-June when the flowers are pollinated by bees, insects and birds that aid in transporting the seeds to various locations. Virginia bluebells are ephemeral wildflowers; the blooming period occurs from mid-to late spring and lasts about three weeks. The central stem, which can reach a height up to three feet, is hairless and usually light green in color. The leaves can reach seven inches in length and are light green with a soft, floppy texture. The Virginia bluebell flowers are arranged in clusters and the tubular baby blue flowers flare at the mouth, displaying their bright yellow stamen. The flower clusters hang from arching stalks at the tips of the branches. The flower is tubular at the base and forms a bell shape towards the outer rim. They bloom from pink bulbs and when the flowers are ready for pollination, the plant increases its alkalinity to change the pink pigmentation to blue, which is a much more attractive color to various pollinators, such as butterflies and bees.This striking spring flower is a very popular species to be seen at MNA sanctuaries. In Michigan, bluebells grow in southern floodplain forests and rich ravines. Just over ten state localities for them have been documented in Michigan. The vast majority occur in Kent and Ottawa counties. The evening primrose is a vivid flower when it blooms in late spring. This species is a perennial with quite a short bloom period. Its flowers can be seen in May and June. These plants produce stunning bright yellow blossoms that stand out among others. Evening primrose flowers open in clusters at the top of the plant. each flower has four petals and a slightly glossy look. The flowers themselves only last for a day when they first open in the evening. After they dazzle viewers with their brilliant yellow petals, they turn a salmon color before they die and fall off the plant. The flowers of the evening primrose have a large X- shaped pistil which projects beyond the stamens. The leaves of this plant are narrow and lance-shaped. They can reach up to six inches in length and have a silvery sheen on the surface of their petals due to short hairs that cover them. This wildflower grows close to the ground and sprawls out in areas of full sun. Visitors will have the opportunity to see some of these spectacular species of wildflowers throughout the spring at MNA sanctuaries, so be on the lookout for some of these brilliant flowers! You can enjoy a whole weekend of wildflowers on our Wildflower Weekend Getaway, or take a guided hike during the Wildflower Walkabout series. Anticipating 13 people joining us at Mystery Valley, we were slightly giddy to see car after truck arrive at this very special Odyssey stop. As our eighth sanctuary on the tour and kicking off point for Segment #3, the unique geological characteristics of Mystery Valley had been highly anticipated; what a pleasant surprise to get to welcome 27 hikers! One of our Odyssey goals had been to introduce MNA to more local folks, and this was a huge success at Mystery Valley as we frequently heard, “I have lived here for years and always wondered what this place was like.” We also heard stories of local lore/history about the baseball teams that played on the valley floor and native Americans who once lived on the property, tractors disappearing into sink holes, and even the legend of a man who traveled underground for miles through the caverns and streams and came out in Lake Huron. It is also a treat to meet up with hikers who have joined us on previous hikes; we are beginning to feel like family! We are always happy to see our intrepid photographers and thank them for past work; we are receiving such great pictures from Marianne and Marilyn (thanks ladies). At MNA, our Mission is to protect special natural areas and the rare species that live there. The goals of our blog are to cover the latest environmental issues affecting these areas and provide information about the efforts of our volunteers. Our weekly “ENDANGERED!” column serves to inform you about the endangered and threatened plant and animal species found in and around these special natural areas, and how you can contribute to conservation efforts before it is too late. The second species to take the spotlight in our “ENDANGERED!” column is the Dwarf lake iris (Iris lacustris), a threatened and delicate flower found only along the shores of the Great Lakes. As an example of Michigan’s natural beauty, it is no surprise the iris has become a symbol of MNA’s efforts to protect and conserve special natural areas across the state. The iris is also Michigan’s official state wildflower. Learn more about this Midwest treasure to help save it before it is too late. The Dwarf lake iris is a small, low-growing plant with deep blue-violet flowers that are about two inches tall. The sepals are splashed with white signals surrounded by a deep blue color, making for a vibrant and showy flower. Its leaves are flattened, thin and grow up to six inches long. The leaves are also clustered, stiff and sword-like, and extend from creeping rhizomes. The scientific name “lacustris” translates to “of lakes” and refers to where this rare species grows. Dwarf lake iris grows best along humid, semi-open shorelines in sand or thin, slightly acidic soil over limestone-rich rock. It can also be found on flat expanses behind open dunes. The plant prefers lightly shaded areas, but can also survive in full sunlight. Dwarf lake iris grows most successfully under white cedar, and patches of it can string along vast stretches of shoreline. You can still find this rare flower at the Julius C. and Marie Moran Peter Memorial Sanctuary. This perennial blooms in early May through July. It produces a few seeds, which are dispersed by ants. Fruiting occurs in late June through July. The best time to identify a patch of Dwarf lake iris is late May through early July. 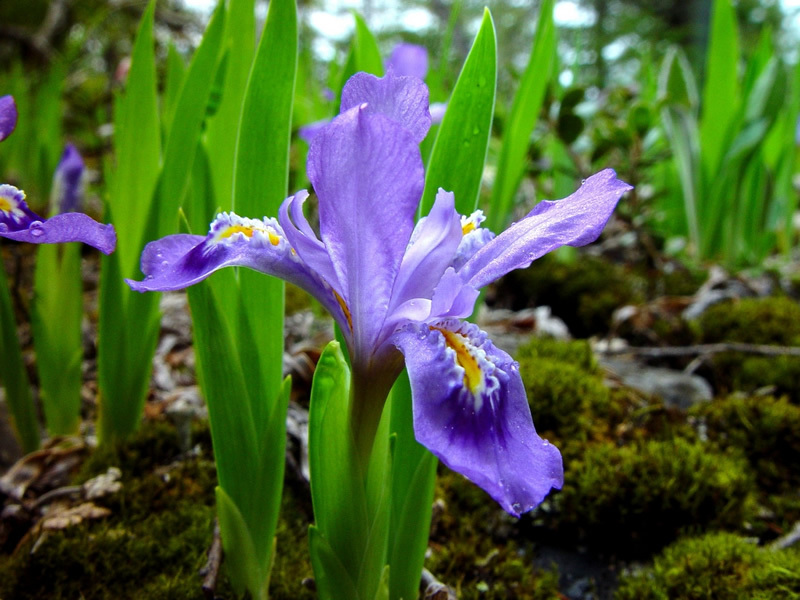 A naturalist first discovered Dwarf lake iris in 1810 in Mackinac Island in northern Lake Michigan. Today, the species’ natural habitat is diminishing. 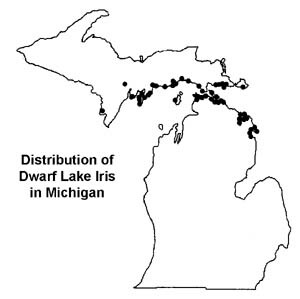 Classified as a threatened species in 1988, Dwarf lake iris is losing its habitat to erosion, lakeshore development and agricultural chemicals. Northern Michigan, Wisconsin and a small portion of Canada are the only remaining natural hosts to this species, and it is disappearing there, too. 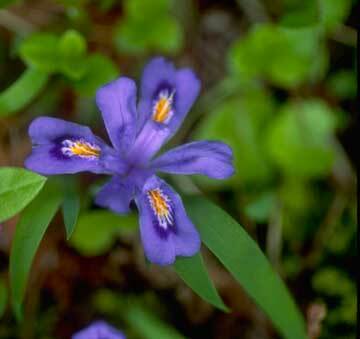 Having very specific growing conditions, Dwarf lake iris is a plant with a fragile habitat. New housing projects and outdoor recreation areas can disrupt a beachside populated by this rare flower. As beautiful as it may be, picking the iris can prevent it from reproducing. When its flowers are pulled out, the plant is often uprooted and is no longer able to produce seeds. The natural world supports us, thus, protecting this rare species could benefit us in the future. Scientists have discovered that closely related plants have similar chemical components. For example, the Yellow flag, an iris native to Europe, has been used as a source of black dye and ink. The U.S. Fish and Wildlife Service is developing a recovery plan that identifies actions needed to help Dwarf lake iris survive. A variety of government and private conservation organizations are working to preserve the Dwarf lake iris and its natural habitat. Because many plants grow in private residential areas, voluntary protection agreements have also been made with some landowners. If you choose to grow Dwarf lake iris, be sure to purchase it from a nursery and avoid digging up native plants from natural habitats. Removing the flower from the wild is both illegal and detrimental to its survival. Also, avoid using insecticides and chemicals on home gardens and lawns to keep water clean. If you come across a Dwarf lake iris in the wild, report it to your local U.S. Fish and Wildlife Service so the area can be better protected. MNA volunteers are currently working to protect this and other endangered and threatened species, and you can help too. Join our efforts as a volunteer removing invasive plants in the special natural areas where this species lives. Or, become a steward and take responsibility for planning efforts to maintain a specific MNA sanctuary. To find out how to get involved, visit our website.